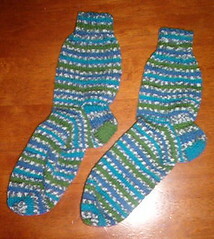 Nicole's Needlework: ocean medley socks finished! I finally finished something! Working full time is definitely taking time away from my knitting. I did manage to finish my Ocean Medley socks tonight. They're a little tight, but I think they'll stretch. Next time I would definitley use size 1 needles. The 0's are just too small for me! Well it's past my bedtime (I have been going to bed at 8:30 everynight. Argh.. Maybe I should drink some coffee and try to stay up because I have to work until 11 pm tomorrow!! Write more later!